Renovating a room in your home by installing a ceiling fan will transform the room's look and bring it some welcome ventilation. But when selecting a ceiling fan there are some things to consider in making the right decision. Deciding on lighting separate switching for lighting and fan controls. 1. Fan Location: Determining a safe location for your fan is the first step. You should not install a ceiling fan in a ceiling that is less than 8 feet tall as the fan blades should be mounted no lower than 7 feet high. You also want to make sure the fan blades will not have anything obstructing air flow within 30" of the fan blade span (tip to tip). Finally, make sure the fan will be attached to a rated and properly supported ceiling fan-box that will hold the weight of the fan and light. 2. Maximum Height of Ceiling Fan Fixture Itself: Measure the height of your ceiling and subtract 6'-6" from it. That will give you an approximate maximum height the total ceiling fan assembly can be measured from the top to the bottom of the fan or the lamp (if the fan has a light). So for example, if you have an 8'-4" ceiling you can have a 1'-10" (22") tall ceiling fan fixture overall height. If you pick a combination fan / light fixture that is too tall for use with the ceiling height, inadequate clearance results and a person may wind up walking into it with their head. I know it sounds obvious but I have seen many installations where the fixture was much too for its ceiling height and ended up being a safety risk. 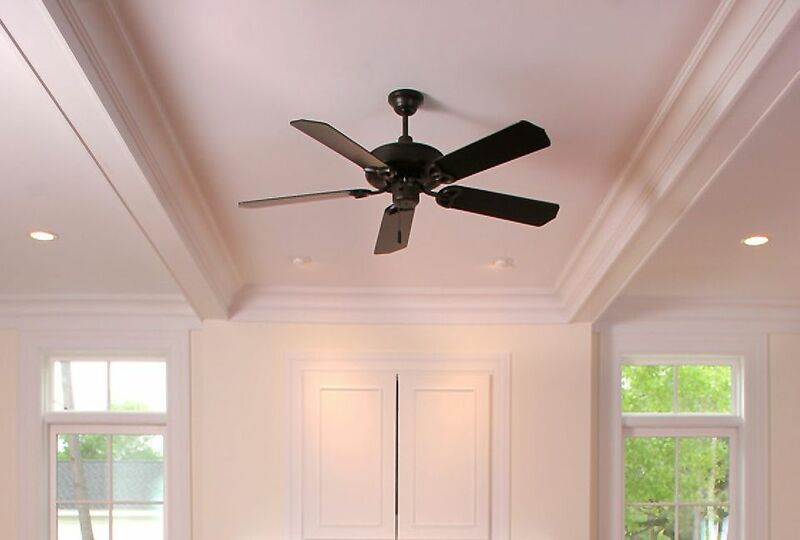 If your ceiling is under 9'-0" you should be shopping for a low-profile ceiling fan. 4. Remote Control Remote control of the fan speed and lighting is a popular option and is very common on quality ceiling fans. Like your garage door opener, a transmitter is held in your hand or mounted to a wall and the radio receiver is installed in the ceiling fan motor assembly. The receiver and transmitter are synchronized using a DIP switch, again similar to your garage door opener. 5. Lighting and Controls: Lighting is another popular option and there are many styles and types of lighting available including incandescent, fluorescent and LED lighting options. The ceiling fan can be wired so the light and fan are individually controlled from the wall switch or they can operate in unison. So with the above considerations you will have thought through more issues than most people who go out and buy a ceiling fan with little to no idea about what they are buying or if the fan will work. You will now know the right size and features you want and it will make your search much more productive.